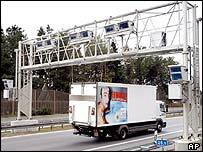 Germany has begun testing a new system for levying toll payments for the use of heavy goods vehicles on its motorways. 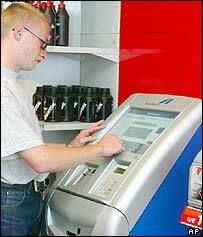 The system uses state-of-the-art satellite technology and is aimed at helping fund the maintenance of Germany's transport infrastructure. However, delays and problems with the project have raised serious doubts about it. Pylons have been erected across the country holding banks of infra-red detectors above motorways - part of a unique, high-tech toll system. The idea is that goods vehicles weighing more than 12 metric tons pay between nine and 14 euro-cents per kilometre depending on the weight of the truck. The government hopes to raise 650 million euros a year through the scheme. The system is operated by a consortium set up by car manufacturer DaimlerChrysler, phone giant Deutsche Telekom and French toll road operator Cofiroute. It is controlled by a special device in the lorry which communicates with satellites in the US-made Global Positioning System to track the vehicle's progress. The infra-red detectors read licence plates and check them against a central database to make sure the lorry has been registered with the transport computer data base. Lorries belonging to foreign companies will be able to pay their tolls via the internet or at service stations along the route. But the BBC's Ray Furlong in Berlin says the project has run into severe difficulties, and the future of Transport Minister Manfred Stolpe is now in the balance. The system was due to start on Sunday, but has already been delayed. It is estimated Germany needs to deliver 450,000 on-board devices across Europe to meet the new start deadline of 2 November, but so far only 75,000 are available. Worse still, many do not work - in tests, their fuses burnt out when the driver switched on the ignition. Mr Stolpe said he was nonetheless confident that the system would be up and running by the deadline. This was "a question not just of reputation but of honour" for the companies involved, he added. Meanwhile the European Commission has concerns that the system might bring unfair disadvantages for non-German truck companies. Critics are calling it a white elephant and point to simpler ways of levying tolls such as in Austria, where you just have to buy a coloured sticker and put it on your windscreen.